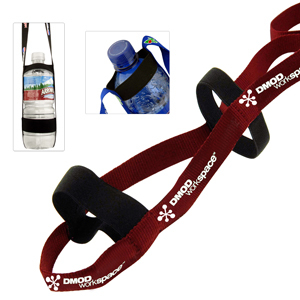 A 19mm wide x 457mm long polyester lanyard that cradles a water bottle and supports it from the sides and bottom. Price includes a one colour, one side, step and repeat imprint. Water bottle not included. SKU:L-259e. Categories: Lanyards, Promotional Merchandise. Additional colours on first side are $0.08(G)/pc/colour, plus a $60(G) setup charge/colour. For 2nd side imprint add $0.10(G)/pc for the 1st colour and $0.08(G)/pc/colour for additional colours plus a $60(G) setup charge/colour. Production time starts after all approvals. See production time for lanyard production details. Lanyards are bulk packaged 10 pcs/bundle. Add $0.05(G)/pc to individually polybag each lanyard.